Inspiration is closer than you think. As she started wondering what to do with ridiculously small pieces of fabric samples ideas were overflowing and ended up like shown on the pic. This is her newest trash creation skirt made out of ready sewn jeans samples like pockets and buttonings. Unique 242 skirt is made out of 27 pieces of different parts of jeans and it has 15 functional pockets. There'll be some pictures of another skirt in gray shades she made for her friend as a birthday present. Pics of Nini are also featuring her new hair after going bald last year there's been some development to dreads again. 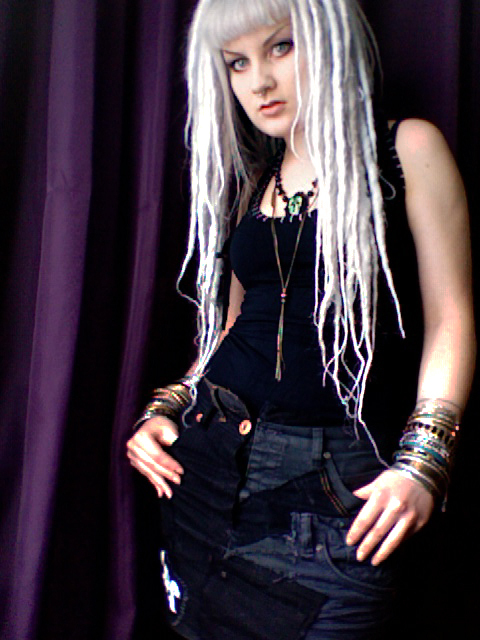 Basic white & silver mixed dreadlocks with silver bangs. You can also spot why she might be mistaken of a hardware store. Latest additions to her multiplying bracelet collection are silver skull bracelet and this delectable turquoise egyptian style scarab bracelet. Necklace shown on the pictures is Nini Van Deering's own design. 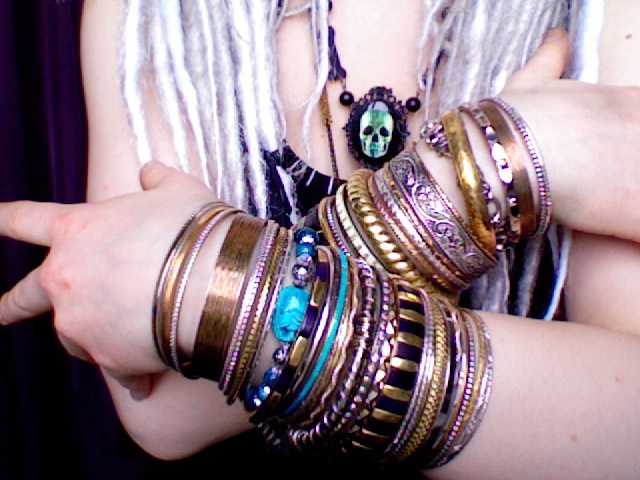 She's going for some serious Bling Bling here!